Christina Mei holds up her lab-on-a-chip device. 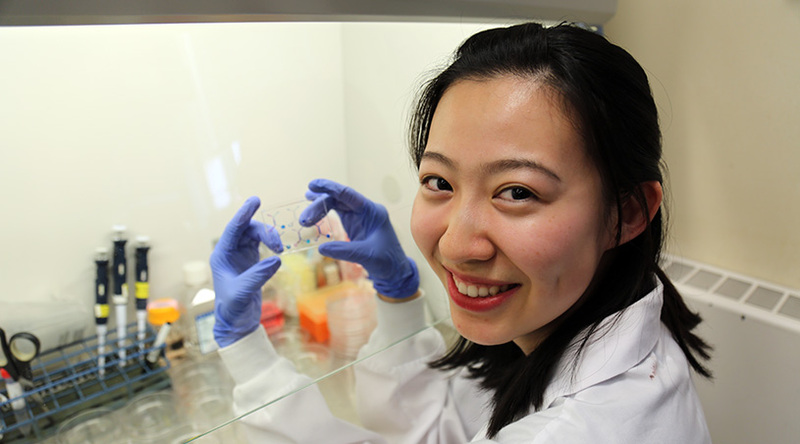 The department awarded First Year MASc student Christina Mei first place for her oral presentation at this year’s Graduate Research Symposium held on June 27. We visited her lab to learn more about her experience that day, as well as her thoughts on being a grad student at MIE. Tell us a bit about your research. My research focuses on developing a microfluidic platform for studying the impact of exercise on breast cancer bone metastasis, which is the migration of breast cancer to the bone. I am working under the supervision of Dr. Lidan You. What inspired you to study this topic? I developed interest in microfluidics during summer research in Second Year undergrad here at MIE. Coming from an engineering background and having a strong interest in biomed, I am especially interested in using microfluidic devices to design tools that can help scientists to study biological diseases in vitro. What was the biggest challenge you faced during the symposium? Translating biological language into terms that engineers can understand was the biggest challenge. I had to rehearse in front of people with different backgrounds to see if they could understand. What was the biggest surprise about being a grad student? The importance of the research environment. I think having a supportive supervisor and supportive colleagues help you to thrive in a research environment. What’s the best aspect of the MIE department in your view? MIE creates a very diverse research environment, where I’m exposed to a huge variety of research topics. It is especially beneficial for my own research, because my project is a combination of mechanical engineering and biomedical engineering. If you could give one piece of advice to current or future grad students, what would it be? Research is difficult. You want to work on something you are passionate about, so that you have the drive to conquer these difficulties.